A unique Hallmark design, the XOXO Bouquet is a great way to send hugs and kisses to your love! 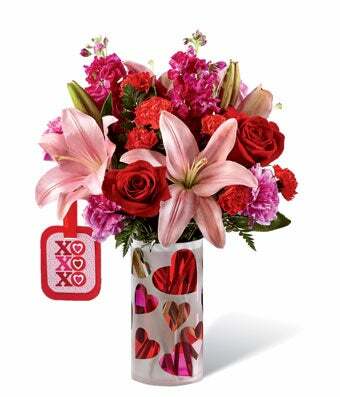 The recipient will love the Valentine's Day flowers and the unique glass vase and all thanks to you for making it extra special with this special delivery! Hand-delivered from a local florist in a keepsake frosted glass vase with pink and red heart designs. Regular bouquet includes 9 stems. Approx. 14"H x 12"W. Deluxe bouquet includes 12 stems. Approx. 16"H x 13"W. Premium bouquet includes 15 stems. Approx. 17"H x 14"W.